We offer the following range of Rental Lecterns, Hire Lecterns, lectrum or lectrums, podium stands and podiums for sale with varying features (including options with inbuilt microphones) to give an air of presence to your presenter. P.A Amp with speakers Go to the PA Equipment Hire page for PA pricing. Discounted pricing available when lecturn & AMP system supplied together. Note: Lectern rental, lectern hire, and lectern rent prices are subject to change without notice. We specialise in lectern hire Melbourne, Sydney, Perth, Brisbane, Adelaide, Hobart, Canberra, Darwin and throughout Australia. To make an inquiry regarding our Lecterns Australia or podium stands for rent and or hire, please feel free to contact us either by telephone (on 0418 574 767 or in Victoria on (03) 8420 7788), email or by using our Inquiry & Booking Form. We will endeavour to respond to your email or Inquiry Form submission within 24 business hours. 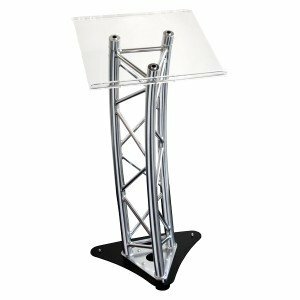 As our available products change regularly, it is not possible for us to list every Lectern or podium stand we have for rent/hire on this site. If you cannot find the Lectern you are looking to rent or hire here, please feel free to call us (on 0418 574 767 or in Victoria on (03) 8420 7788), email us or use our Inquiry & Booking Form to make an inquiry. We will endeavour to respond to your inquiry within 24 business hours. We are lectern specialists and can satisfy just about any requirement! 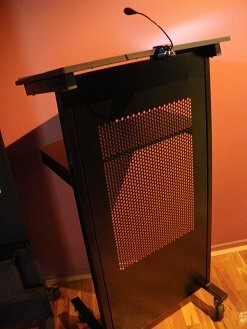 We also sell Lecterns - you can see our lecterns for sale on the Lecterns for Sale page. Please feel free to call us (on 0418 574 767 or in Victoria on (03) 8420 7788), email us or use our Inquiry Form to make a purchase inquiry. We will endeavour to respond to your inquiry within 24 business hours.